Shortly after I got my second body back in October, I noticed that once in awhile, it behaved very oddly. For some unknown reason, it would sometimes take an abnormally long exposure in bright daylight after having just shot properly. In one instance, it jumped from 1/800sec to 1/2sec, and then right back up to 1/800sec. Well, while shooting a concert this past Saturday, it broke for good, and I finally found out what was going on. Thankfully, the body is still under warranty, so this is now Nikon's problem. What you see is a shutter blade (part of the shutter mechanism) that has become detached from the arms that move it up and down. 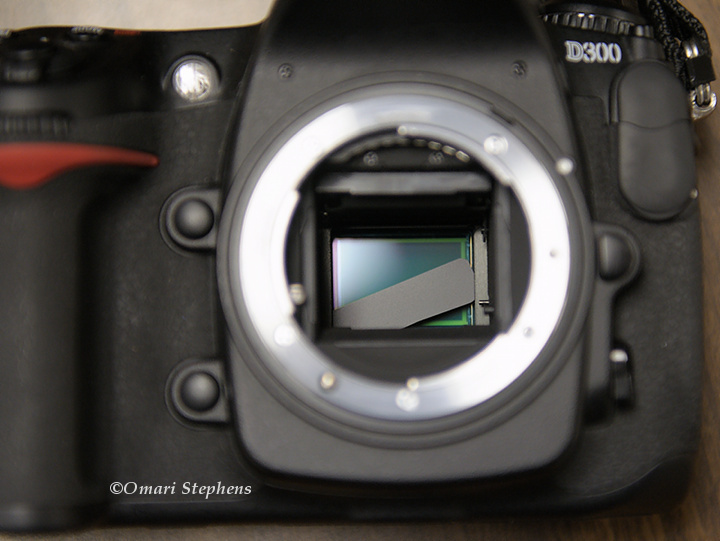 The greenish rectangle in the back is the camera's sensor. Here you can find a nice, 2000fps video of what a shutter actuation is supposed to look like, and for the curious, here is a simple yet detailed diagram of the important parts of a DSLR. Cheers!